Basic Victoria sponge recipe; flour, butter, eggs and sugar. In addition, blue food dye, rolling icing, nutella and dolly mixture, sprinkles. I created the base cake first from two Victoria sponges with nutella spread in between. I rolled the ready-made icing and attached it to the top of the cake, and trimmed off the sides. 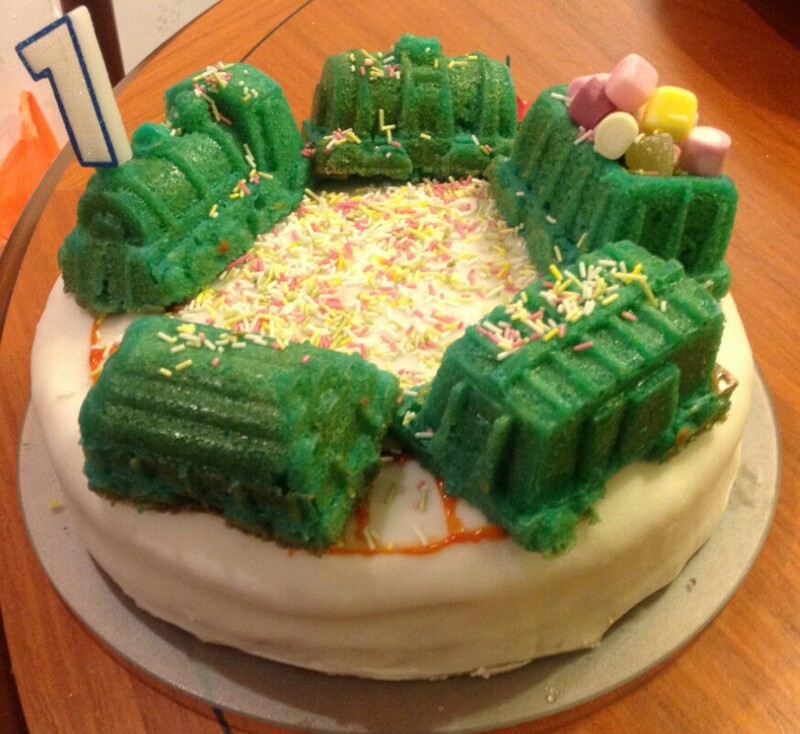 I used a cake mould to create the train set, and added the food dye to include come colour. When the train set was cold, I placed them on the top of the base cake and added dolly mixtures to one piece. It’s always good to give back and if, like me, you are lucky enough eat lovely cakes regularly then what better way to do so than cake related volunteering. As a child I remember the cake at my birthday parties so vividly; pink turrets on a princess castle stands out as a particular work of art. However, there are some children whose parents can’t afford to buy the ingredients to make them a birthday cake, or do not have the cooking resources needed to do so. Hackney has been gentrified in the last few years but there are still a lot of poverty stricken people that have children to care for. Free Cakes for Kids is a fantastic charity that really helps these people and that I’m thrilled to have found. « Better than the “Bake Off” final?